A little bit of glitter can go a long way. It’s a fabulous way to give your day a little something lustrous, whether it’s on an outfit, an accessory, or even in makeup or lotion. 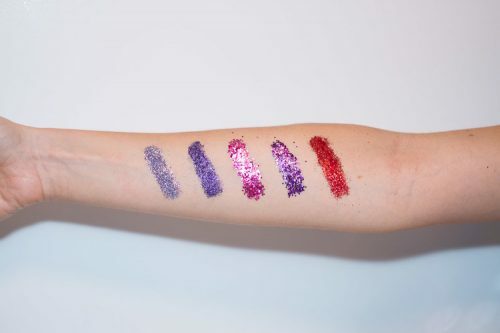 And of course our dance party favorite: body glitter. However, it’s less fabulous, when all those magical sparkles–traditionally made of tiny bits of plastic–wash out into the ocean and float around for eternity. (Sound familiar? Your face wash did the same thing with its now banned microbeads). Thankfully, Greenpoint Glitter is helping take the eco-guilt out of glitter with their certified compostable body glitter, specially produced from biodegradable film. 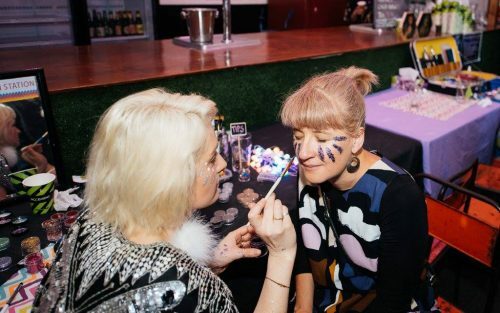 We sat down with Greenpoint Glitter founder Prue Watty to get the nitty gritty on her company, the glitter business, and what makes biodegradable glitter so special. GP: Tell me about how you got into glitter. When did it occur to you that the world needed more biodegradable glitter? Prue: I’d been thinking about starting my own business for a while, and I’d been looking for the right idea. Last year, one of my girlfriends came over from Australia and gave me some big packs of wholesale glitter and some beautifully packaged small pots from Berlin. Then, I realized there was potential for a business. 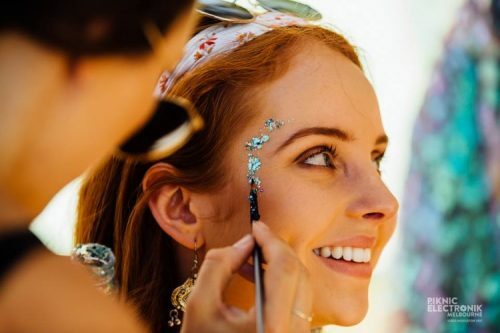 I was also chatting with some friends in Australia who worked on a big outdoor bush music festival called Rainbow Serpent, and they were telling me about how bad glitter is for the environment. There’s glitter everywhere after an outdoor festival like that. My friends suggested I look into biodegradable glitter, which I hadn’t really considered before. I started doing some research and realized how damaging PET plastic glitter actually is, especially now that glitter is trending towards a super chunky texture. Finally, in December of last year, I decided to give it a shot and bought a bunch of biodegradable glitter from a supplier in the UK, packaged it up, made my own little mix colors, and I was in business. GP: In addition to selling glitter via your website, you also offer event experiences. How did that side of the business come about? Prue: I started doing events on New Year’s Eve last year. I did my first one with two girlfriends at a big warehouse party in Brooklyn, and we had this huge line for the entire event from 9pm til 3 in the morning, and that made me realize there’s a real market for this. GP: What exactly do you do at an event like that? Is it like adult face painting? GP: What is biodegradable glitter made of? How is it different from regular glitter? Prue: PET glitter is of course made of plastic, but this biodegradable glitter is made primarily of eucalyptus. So you take a sustainable, environmentally sourced wood pulp, turn it into a giant sheet of film, and then like plastic glitter, cut it up into tiny little pieces. To be considered biodegradable, more than 90% of the product has to break down within 180 days. People often ask how it biodegrades, and for that process to start it needs to be under the right heat and moisture conditions. So it won’t break down on the shelf or at home. It really needs to be outside or in water. GP: It sounds fairly technical—do you have a science or chemistry background? Prue: To be honest, not at all. I’d love to work with someone to actually make the glitter here rather wholesaling, and I think that will be a next step for me. There really is an increasing need for it—more and more events are banning glitter, and while biodegradable glitter still isn’t perfect, it is much better for the environment. GP: Why is it called Greenpoint Glitter? What’s your connection to the neighborhood? Prue: The business was really born in my apartment in Greenpoint. One night, after I’d gotten the idea for the initial business plan, some friends and I came home after a late night and got out this big piece of paper and made a word tree mapping out the brand identity. At that point I’d only been in the States for 8 or 9 months, and Greenpoint was a really important part of my New York story, so I wanted to include it in the name of the company. And the green nature of the product is a nice tie-in as well. GP: I’m curious to hear more about how your customers use the product. Do you think people save their glitter for special occasions? Is glitter becoming an everyday look? Prue: I’d love for glitter to become more of an everyday look. I’ve got a number of different sizes of glitter particles, and the really small particles are almost like a glitter paste, which are quite subtle. There were lots of glitter accents and glitter eyes in the runway shows last season, and it’s not uncommon to see people wearing glitter out on a Saturday night. Pretty much every time I go out in the city I’ll bring glitter with me. As soon as I take it out it just brings joy to everyone. A little bit of joy is a nice thing to be able to pull out of your handbag. Follow Greenpoint Glitter on Instagram. Katy is an arts administrator and sometimes writer who lives in Greenpoint. She has worked at Dixon Place on the LES, with Buran Theatre, and currently serves as the Grants and Web Administrator at the Whiting Foundation while pursuing an MA in Arts Administration from Baruch College.